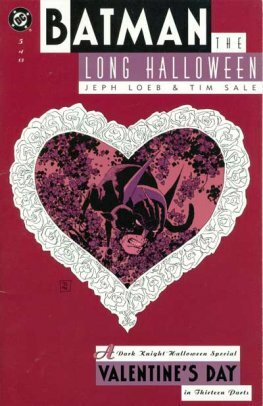 Batman: The Long Halloween is a 13-issue comic book limited series written by Jeph Loeb with art by Tim Sale. It was originally published by DC Comics in 1996 and 1997. 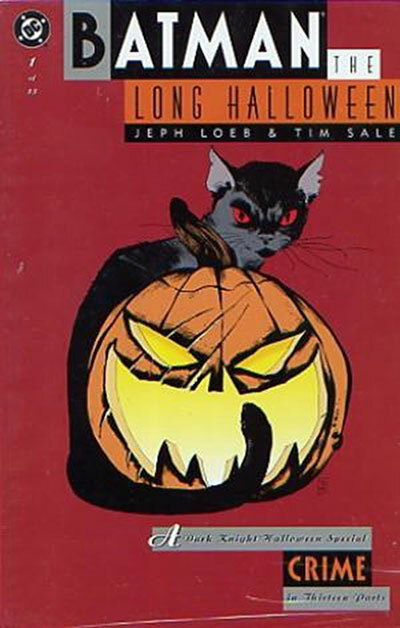 It was inspired by the three Batman: Legends of the Dark Knight Halloween Specials by the same creative team. The entire series has been collected in both trade paperback, and as part of the DC Comics Absolute Editions. The series' success led to Loeb and Sale to reteam for two sequels, Batman: Dark Victory and Catwoman: When in Rome, which parallels the events in Dark Victory. 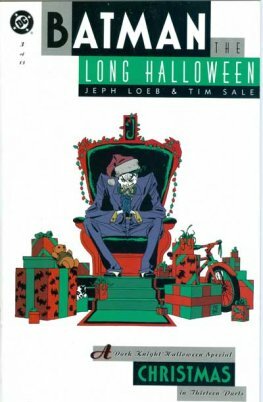 Taking place during Batman's early days of crime fighting, The Long Halloween tells the story of a mysterious killer named Holiday, who murders people on holidays, one each month. Working with District Attorney Harvey Dent and Captain James Gordon, Batman races against the calendar as he tries to discover who Holiday is before he claims his next victim each month, while attempting to stop the crime war between two of Gotham's most powerful families, Maroni and Falcone. This novel also acted as a main introduction for one of Batman's most elusive foes, The Calendar Man, who knows the true identity of the Holiday killer but refuses to share this with Batman. He instead riddles and gives Batman hints from his Arkham Asylum cell. The story also ties into the events that transform Harvey Dent into Batman's enemy, Two-Face. Enemies such as Scarecrow, The Joker, Mad Hatter, Poison Ivy and The Riddler, among others, also make an appearance. In continuity terms, The Long Halloween continues the story of Batman: Year One. It also revolves around the transition of Batman's rogues gallery from simple mob goons to full-fledged supervillains. It also tells the origin of Two-Face, adding along to the story in Batman: Annual #14.